After the wine contest and the Pinot contest, last night was the Merlot contest. And boy did passions run lower. I thought that there would be many more really bad wines, just because people don’t really know the grape, and we’ve all had some pretty disgusting Merlot. Meanwhile, I was hoping for a couple of magnificent standouts: this is a key Bordeaux grape, after all, and Chateau Petrus is 100% Merlot. Neither really happened. Instead, we got some interestingly counter-counter-intuitive results. The format was the same as always: each contestant brought two identical bottles of wine. One was tasted blind, while the other was kept for the prize pool. This year, every bottle had to be a Merlot. Everybody scored every wine out of 20, and we added up the results, which you can download as an Excel spreadsheet with a wealth of information in it. With 14 people tasting 12 wines, the maximum score was 280. In the end, the scores ranged from 141 to 209. 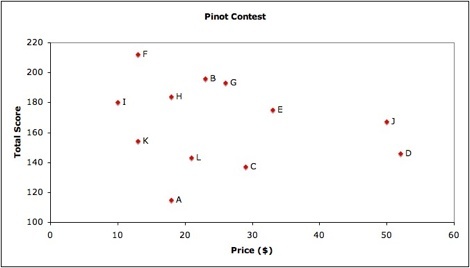 The Pinots had a slightly negative price-quality correlation (as measured here) of -0.2; the Merlots, by contrast, had a clearly positive price-quality correlation of +0.55. What’s more, after reading the story of wine judges who couldn’t even identify identical wines, one game couple — Gaby and Dave — brought four identical bottles, placing two of them, separately, in competition. I was expecting them to come hilariously far apart, but astonishingly they got basically exactly the same score, garnering 195 points and 196 points respectively; not a single person rated the two wines (D and J) more than three points apart. Maybe this add-up-the-totals technique actually does work, after all! The Merlots also, interestingly, scored consistently higher than the Pinots. I’m not sure that means they’re better wines, though: the consensus of the people who came to both parties was that the Pinots were much better wines. After both of the first two wine contests I ran out to buy the wines I loved; after this one, I’m glad that the second bottle of the winning wine is still in my cellar, but that’s about it. While total scores can be compared within a contest, I don’t think it’s particularly useful to compare them across contests. In general, the Merlots seemed rather bland; the comment which sticks in my mind is “it tastes like wine”. A lot of them didn’t taste of much at all, or just weren’t memorable. One thing I’d love to do, but can’t do in my version of Excel, is plot a histogram with the scores along the x-axis, from 1 to 20, and the number of times that score was given out going up the y-axis. I suspect that the Merlots will be much more bunched together in the middle, and have much thinner tails, than the Pinots; the spreadsheet for the Pinot contest can be found here. If anybody wants to chart the two varietals in that way for me, I’d be much obliged. Update: Here they are! Thanks Todd! There do seem to be two lessons here for people buying Merlot. The first lesson is that if you want to get something really good, then it might actually be worth moving into the $20-and-over range; if you’re not going to do that, just grab the cheapest Merlot you can find. The second lesson is that California clearly beats France. The two wines which got more than 200 points were both Californian; the next-best wine (the D and J pair) was from Washington. After that, the fourth-best wine (wine E) was actually the cheapest of them all: a $4.99 Chilean Merlot I picked up at Warehouse Wines on Broadway. (It’s the 2004 Carmen Merlot from the Rapel Valley, if you want to look for it yourself.) 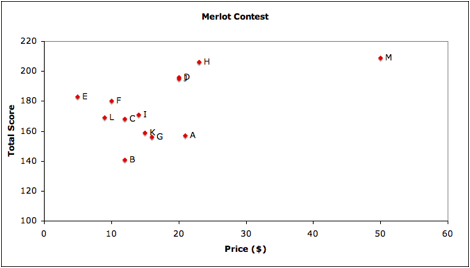 The Chilean wine easily obliterated every other wine in the bang-for-the-buck stakes, with 36.6 points per dollar; meanwhile, the lowest bang-for-the-buck was actually the winning wine, which got only 4.2 points per dollar. All of the French wines came from Bordeaux, including the worst wine of the lot (wine B), which got just 141 points. The other two French wines (wines C and I) didn’t really stand out. The field included one wine from New Zealand (wine A), which was quite expensive and did quite poorly; a non-vintage wine from the North Fork of New York (wine L), which at just $9 came second in the bang-for-the-buck stakes and got a respectable 169 points; and a novelty charity wine, Abreu’s Finest (wine K), which only really managed to eke out a single. There was also an old 1998 Australian wine (wine F), which once upon a time retailed at about $25 a bottle, but which was bought on sale for just under $10; it did quite well, getting 180 points. The runner-up, from Murray, with 206 points, was an organic 2004 Robert Sinskey Merlot (wine H) which cost $23. The winner, from Michelle, which got 209 points, was the 2005 Merlot from our favorite vineyard, White Cottage. We tasted it at the ranch in December, loved it, and brought back two bottles especially for the wine contest, as part of the barbell strategy: one very cheap wine (the $5 Chilean) and one very expensive (the $50 wine from Napa). The strategy worked out great, with the wines garnering fourth place and first place, respectively, out of 13 wines in all. Many thanks to everybody who came: as ever, a fun time was had by all. And here’s a picture of the winners, Michelle and Murray, with their expensive Californian Merlots. Congratulations to both! for more information on how crooked Middlesex County, NJ is, and the Attorney General’s office is. For some, it may be unbelievable. For others, it is par for the course. A note for the ELDERLY—be careful growing old in NJ. The blue wall will get you every time. I want to see a Zin test! I’ll send a bottle or maybe yet, buy a plane ticket!! !